I am pretty sure you have heard of chicken soup healing the weary soul. Well when I was small girl and unwell I remember my mom promptly giving me chicken soup to make me feel better. Now that I am older, I have discovered one other therapy for my soul and that is… coffee. Whenever I get stressed from work or just want to lounge on the couch and read a good book, I make sure that my cupboard is stocked with some coffee to see me through. Truth is, a lot of people may disagree with me about coffee being good for the weary soul. But coffee aficionados around the world will tell you an entirely different story. People who love to wake up to the aroma of coffee wafting in the air, people who never fail to start the day with a cup of freshly brewed coffee, people who make sure that buying coffee is part of an enjoyable routine… all these people will gladly tell you that coffee has more to offer than the misguided information you may have heard from others, often the wrong sources. Coffee is reported to help you recover from work-outs and fitness routines. This is not wishful thinking! According to the March 2007 issue of the Journal of Pain, the official journal of the American Pain Society, coffee lessens the effect of “muscle pain and force loss” after an exhaustive workout. So guess what I won’t neglect doing after I leave the gym next? You’re right – buying coffee. Coffee guards the liver against cirrhosis. Of course we all know that cirrhosis of the liver is largely due to consuming large amounts of alcohol. But let me tell you this. The results of a study published in the Archives of Internal Medicine conducted between 1978 and 2002 showed that drinking a cup of coffee a day reduces the risk of developing cirrhosis, particularly alcoholic cirrhosis, by a fifth while drinking 4 cups a day lessens the risk by a whopping 80%. That’s why after drinking wine and other alcoholic beverages on a big night out I often finish my evening by buying coffee at my favorite coffee shop before heading home. Coffee helps lower the risks of Type 2 Diabetes. A study says that people who consume 6 or more cups a day is 22% less at risk of developing diabetes. The 11-year prospective study on postmenopausal women was done by the School of Public Health, University of Minnesota. Need I say more? Regularly drinking coffee will increase your fiber intake. Do you know that a cup of brewed coffee represents 1.8 grams of fiber? I was surprised! As reported in the Journal of Agricultural and Food Chemistry, brewed coffee contains ample amount of dietary fiber as well as significant amounts of antioxidants. You may not agree with me but I should say it feels good to have science backing me up. For me, drinking moderate amounts of coffee has a lot of advantages to my physical health. 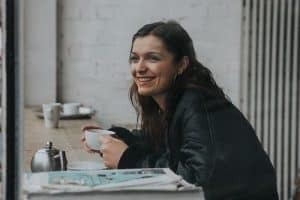 But far better than that is the feeling of well being I experience every time I drink a cup of freshly brewed coffee, whether it be in the morning to start my day or on a lazy afternoon when I curl myself up in the bean bag with one of my favorite books. And of course, buying my favorite coffee from the many coffee shops and grocery stores always puts me in good spirits as soon as I smell those roasted beans… I feel better all over. Tell me what do you love about coffee; is it more than just the aroma and great taste?